This is a really elegant soup for day #17 of Soup Month and the earthy flavors would be a great start to a holiday meal. Look for assorted mushrooms in your local market to see what is available. If you can find chanterelle mushrooms they are delicious in this soup. In a large soup pot over medium heat, add olive oil, onion and garlic. Saute 3-5 minutes until golden. Drain porcini mushrooms and chop. Pour water thru a coffee filter to remove and small pieces and set aside. Increase heat to high and add porcinis and the fresh mushrooms. Cook about 5 minutes or until mushrooms are softened and golden. Add potatoes, reserved porcini liquid and cognac. Cook 1-2 minutes longer. 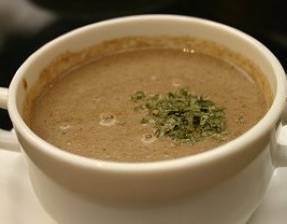 **Note: To top off this soup you can garnish with finely chopped chives or saute about 1 cup of mushrooms in unsalted butter for a few minutes and gently place 2 or 3 mushrooms on top of each serving of soup.